The Doctors would like to welcome you to Oneida Dental Group. Invisalign® is a series of removable, clear aligners that dentists use to promote an invisible way of straightening teeth without braces. 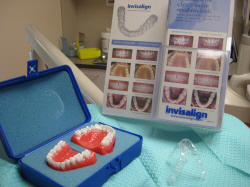 Impressions and pictures are taken at the office and sent to a lab that customizes the trays using computer technology and the patient will receive their new aligners and switch them out about every two weeks. 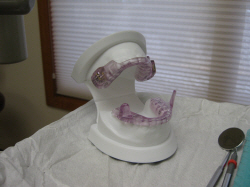 Somnodent® is a mandibular advancement splint designed to keep the airways open at night. The mandible is a person's lower jaw and such an oral sleep appliance advances this lower jaw to create space in the back of the throat to help keep the airway open. In sleep disorders, the airway often collapses, resulting in snoring or episodes of sleep apnea. It is similar to a sports mouthguard and worn only when the patient wants to sleep. It has been very successful in the treatment of snoring and sleep disorders. 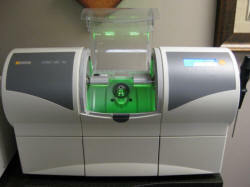 CEREC®is a machine that uses CAD/CAM technology to take pictures of your teeth to create a restoration without impressions or a lab. This means that we can restore teeth in a single appointment using a high quality ceramic material that matches the natural color of other teeth. 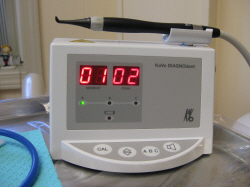 Diagnodent® is a laser probe handpiece that is an accurate, reliable caries detection aid. Even very small lesions are detected at the earliest stage, enabling you to protect and preserve the tooth substance. 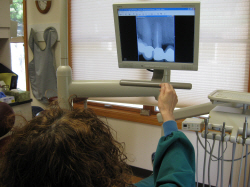 Digital Xrays use less radiation than conventional xrays and can be stored in the computer's memory. An advantage of this is that the image is immediately available to be viewed and can be enhanced for detail and chairside explanation. They also eliminate the need for chemicals to process xray film. 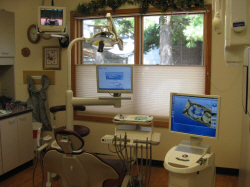 SoftTissue Lasers are an aid in treating gum tissue. 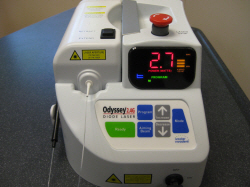 The laser precision eliminates bleeding at the sight and reduces healing time. They are minimally invasive and patients experience less post operative discomfort.